The “spirit” was crafted by a rabbinical board headed by HaRav Y.K. Marlow, of blessed memory, former head of the Beis Din of Crown Heights. The halachic sections feel more like a chat with your favorite rebbetzin than the crucial informational resource that it is. Countless readers have been advised in the privacy of their own kitchens on kashrus, yom tovim, and more thanks to this book. Esther attributes the comfortable writing style and professional presentation to the inclusion of many baalei teshuvah on the committee who had careers as writers, chefs, and artists. Tzivia Emmer, Rivka Katzen, and Tziporah Reitman served as key members of the editorial board. Since the book hasn't been available in print for eight months, there has been a huge demand and a high markup on used copies. The Facebook page (facebook.com/spiceandspirit) grew to 700 fans in one day, with many writing on the wall how they can't wait for this new printing—some remarking how they regret not having bought it in the first place, and some noting how their 36 year old copy has too many food stains on it. Finally, the wait is over and new copies will be available for purchase in time for Chanukah. 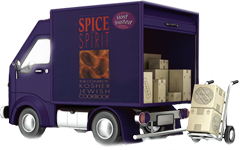 Visit www.spiceandspirit.com or pick up a copy at your local Jewish bookstore to get cooking. 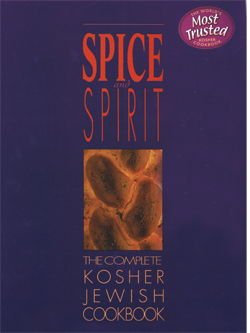 More than a collection of recipes, Spice and Spirit provides detailed instructions for observing…kosher rules…Definitions of what makes food kosher…and explains the spiritual inspiration of each law. A must have for every kosher cook. Tons of easy recipes, tips and menu suggestions.